Even though Christmas Eve dinner was lackluster, by Christmas morning, I was back on track. Over the years the composition of my Christmas morning menu has changed according to taste and adapted according to schedule. I used to make a killer raspberry coffee cake – until I lost the recipe. In fact, just the other day Joel asked me why I never made that coffee cake anymore. Really? It only took him 12 years to miss the Christmas coffee cake? Ten years ago Ina Garten was writing a regular column for Martha Stewart Living magazine, (which unfortunately didn’t last long – I would have loved to be a fly on the wall in those editorial meetings.) 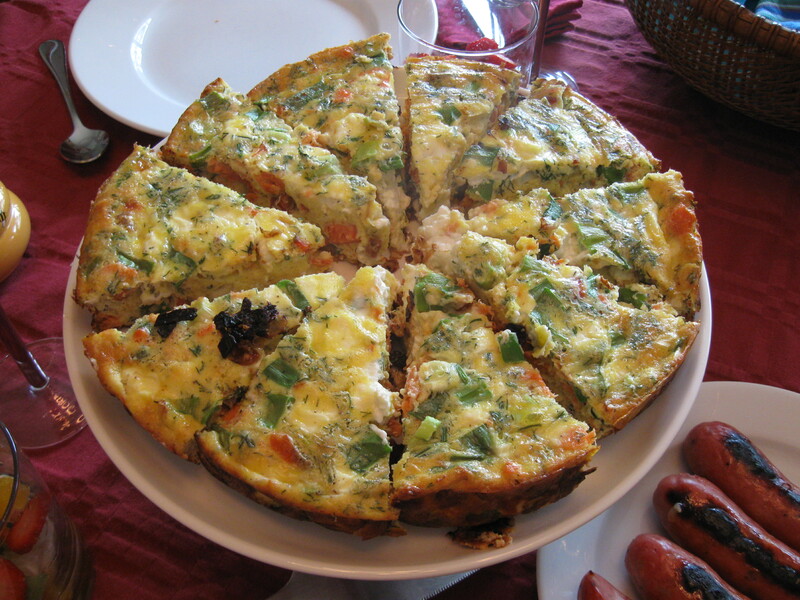 She published a complete breakfast menu – salmon frittata, strawberry corn bread muffins, cheddar-chive scones, (and some other stuff I forgot because I only ripped the page out of the magazine for these three recipes.) However, I do know that the first year I found this article I made the entire menu – and was in the kitchen for hours. This year – since it was just the four of us opening presents – I opted for an easy but sophisticated menu: Ina’s salmon frittata, popovers, winter citrus compote, mango sausage and persimmon champagne cocktails. I always forget that the smoked salmon frittata needs to cook a bit longer than the recipe calls for – around 30 minutes instead of 20. And, it’s really rich so I don’t usually serve anything really heavy with it. But I was really excited to serve it on the new serving pedestal Joel got me for Christmas. It looks so pretty! I’m a big fan of the 1940’s version of “Little Women” and one of my favorite scenes is where Amy (Elizabeth Taylor looking horribly blonde) is frantically mashing fresh popovers into her mouth on Christmas morning. I figured by the way she was wolfing them down they must be good, right? This year I found a great popover mix from Sof’ ella and I think half had been eaten before breakfast. 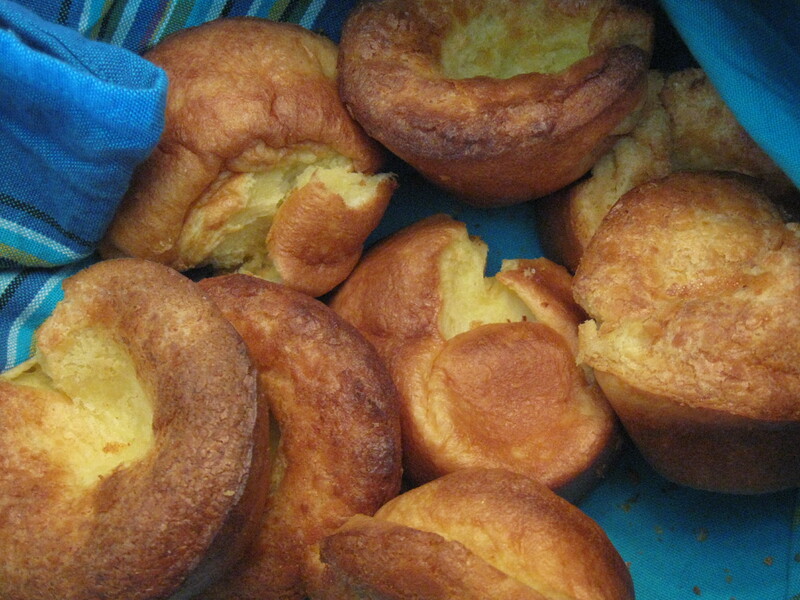 Amy was right, nothing beats fresh popovers on Christmas morning. 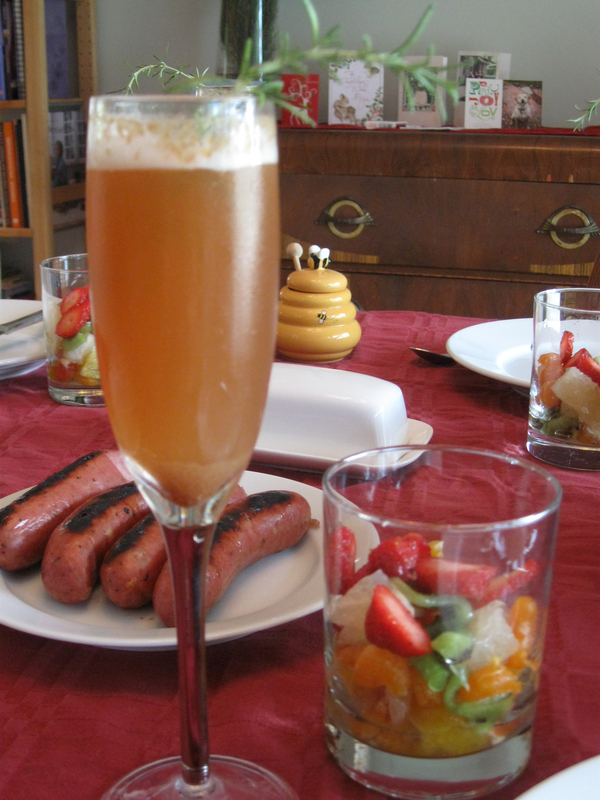 I found the recipe for the persimmon champagne cocktail on Twitter and since I love persimmons (and champagne!) I thought this would be a great brunch cocktail. We weren’t disappointed. I’ve made the citrus compote before – it comes from an old Williams-Sonoma Brunch cookbook – but this year was the first time I had most of the ingredients. I used a pomelo, white grapefruit, mini tangerines, blood oranges (from our tree out back), kiwi fruit and strawberries. All of the citrus is soaked in a clove scented simple syrup and then I top it with strawberries just before serving.